Marlos followed Tomos and Nabile – the two children scrambling up walls and over rooftops as often as not – to an area of Sakhmet that he'd never intended to visit. The houses were small, the streets were dirty, and the poverty was apparent everywhere he looked. He also didn't see the amount of guards that he was accustomed to noticing at street corners and outside stalls. Perhaps there were simply too many petty thieves and criminals down here, such as his companions, and they found it easier to turn a blind eye rather than to try and dam up the River Sakh, as the saying went. Finally, they reached a quiet alleyway where all of the stonework was crumbling and many of the buildings were boarded up, with signs on the boards saying the buildings were unstable. Nabile and Tomos went straight to one of these. Marlos frowned. "Is that safe?" Tomos grinned, clearly proud of himself. "I stole the message board with my own hands. Keeps anyone else from bothering us." Then the two children climbed up another wall – it was no wonder they were both so skinny, between the lack of food and all the running and climbing they did – and into a window, and Marlos followed, tucking his wings as he did to keep from clipping them on the wall. They were still protesting their treatment from last night, and every wing-beat hurt. He landed on the floor, and let his legs give out, sitting right where he'd fallen. This room took up the whole upper floor of the building, but it still wasn't all that large, and the air was tinged with smoke from the hearth fire. There was no furniture except for a few battered wicker baskets of varying sizes and various thin pallets and holey blankets strewn across the floor along with spare clothing and other small items. But Marlos didn't have much time to look around at the room – he needed to focus on the other people. In addition to Tomos and Nabile, there were four others in the room. A lanky Desert Ogrin who looked to be in his late teens crouched beside the fire, which was tended by a blue Kougra with long blonde hair who was about the same age. There was also a yellow Blumaroo boy who was probably between twelve and fourteen – they were all so thin that it was hard to tell – and a red Zafara girl who was probably Nabile's age or slightly younger, who stared at Marlos as though she fully expected him to eat her. Marlos looked at himself – he wasn't anything above average height, and he wasn't that dirty. The Ogrin by the fire stood. "Nabile, Tomos..." Marlos knew that tone – he'd used it himself on new scribes who'd caused moderate-to-large disasters in the Hall. Tomos blurted, "Her idea, Dom!" The little Zafara said, "Sure, Tomos. Throw Nabile to the Werelupes." The Blumaroo said, "Hush, Zina." Nabile said, looking up at the Ogrin – Dom – "It's a good idea. He's a thief like us..."
Marlos interrupted, "I'm not actually a thief – I was framed!" But Nabile kept talking. "... And he needs a place to stay. And he's got some money. He promised he'd pay for dinner for all of us. His name's Marlos." Dom crossed his arms. He was a good deal taller than Marlos, and he was probably stronger – while he was thin, Marlos could tell that the young Ogrin was all lean muscle, and while the scarab-shaped tattoo had looked a little silly on people as young as Tomos and Nabile, on Dom it looked a good deal more intimidating. "Let's hear Master Marlos speak for himself." Marlos decided that it would be best to tell the truth. He didn't have anything else going for him at the moment. "I'm a senior scribe at the Palace." From behind him, either Zina the Zafara or the Blumaroo muttered something that sounded like "Scribbler", but Marlos didn't listen. "Last night, I overheard Lady Marcia plotting to kill King Coltzan." The girl by the fire looked at him in shock. "Lady Marcia? The Lady of the Golden Sword? The hero of the Blazing Plain?" Marlos nodded. "That one. And a mage. I barely got out of the Palace with my tail in one piece. Hid in the garbage bins. Lady Marcia and that mage were still in earshot when they decided that they were going to frame me for robbing her – that way the guards would be on the lookout for me, and I've been discredited if I try to accuse her." The Blumaroo said, "Well, you're neck-deep in the River Sakh, and that's no mistake." Zina elbowed him. "We all know that, Horace." Horace shrugged. "Someone might as well point it out." Marlos sighed, and continued, "I can't go home. I've got nothing but what you see with me right now." Which was still more than what these six urchins had. "No one at all whom I can trust to believe my story over Lady Marcia's." He looked around. How had he ended up in a hovel like this? How did anyone end up in a hovel like this? These children most likely didn't know anything different, but that was another tragedy by itself. He finished, "I fell asleep in an alley last night, and woke up to Nabile trying to take my pouch. And after an altercation, Nabile offered me shelter." Nabile said, "Altercation. It means we jumped him, thick-skull." Tomos muttered, "Fine, fine, Little Miss Scholar." The Kougra by the fire snapped, "Cut it out, you two, before I tie your tails to a clothesline." She added, "I'm Resa. As you've probably figured out, that's Dom, those are Horace and Zina over there, and these two scamps are Nabile and Tomos. Bokan and Ilias are out right now, but they should be back soon – we don't go out at the heat of the day." Tomos said cheerfully, "Not enough people are doing their shopping then, so there's not as much for us, and it's easier for the guards and the shopkeepers to spot us." Marlos took his pouch out of his pocket – he hadn't thought it had looked like much last night, but suddenly it seemed like far more. "I'll share what I have. I doubt I'll be here for more than a few days." It would be over by then. One way or another. Resa said, "We've got tea. It's thin..."
Zina interrupted, "She dropped half the leaves when she had to make a run for it..."
Resa frowned and continued, "And I won't say it's the best..."
Tomos grinned and added, "Because the man who sells the good tea keeps it locked up too tight..."
Resa growled a little. "Will you two be quiet? So it's not much, but you're welcome to some." Marlos was tired, and his head hurt, and he missed his morning coffee desperately. "Oh, please." The cup was made of rough clay – and she was right, the tea was weak and musty-tasting. Marlos wasn't entirely sure that he wanted to drink it after all, but since he'd asked it would look ungrateful to change his mind and refuse. He swallowed it down and tried not to dwell on it, which was easy enough, as the six Scarabs had taken out a deck of cards – he wondered where they'd stolen that from – and started up a rather boisterous game of Cheat!. Marlos had never seen a wrestling match come out of an accusation of cheating before. It hadn't gone on very long – though it seemed that little Zina was cursed with both bad luck and no ability for subterfuge, and she was already losing fairly badly – when two more boys came through the window. The first was a scrawny blue Techo about the same age as Tomos, and the second was a big royal Chomby who had to be at least of an age with Dom. The Techo looked over at Marlos and asked, clenching his fists, "What in Fyora's name is he doing in here?" 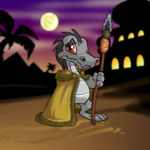 Tomos said, "Nabile wanted a pet, but it costs too much to feed a Mauket, so we got her a Draik instead." But the Chomby laid a heavy hand on the Techo's shoulder. "Cool it, firework." Dom explained how Marlos had ended up in a thief hideout fairly quickly, and the Techo scowled. "What do you bet he walks straight to the guards and brings them down on us?" Tomos leapt to Marlos's defense. "If he walked to the guards, they'd all come down on him first – or do you need to clean out your ears so Dom can tell the tale again?" While Marlos hadn't thought that the Lupe liked him much, apparently he liked him more than he liked this other boy. And the Techo lunged at Tomos. But he didn't get far before the big Chomby grabbed him. "Bokan! Cool it!" Bokan spat, "Get off me, Ilias!" Ilias merely used his free hand to adjust the bandana he wore on his head – he was enough bigger than skinny Bokan that he only needed one arm to hold him steady. Still, Marlos took a few steps backward – the Scarabs' bony little fists hurt. "I'm just here until I clear my name, and then I'll be back home." But then little Zina asked the deadly question. "But how?" Nabile frowned, touching a finger to her nose. "You'd need to prove that Marcia's lying. Which means you'd need to prove why Marcia should lie." Zina reproached, "Lady Marcia. She's Lady Marcia." Horace shook his head. "Not if she'd kill the king, she's not." "But you can't just call a Lady by her first name like she's some Scarab or Copper Crown girl!" Nabile shrugged. "Don't see why not. As long as we're not saying it to her face. Now, maybe if she was a queen..."
Tomos grinned. "So if you were Queen Nabile we'd have to call you that all the time whether you were around or not?" Nabile snorted. "Don't be silly. I wouldn't want to be a stupid queen. But what I was saying was – to prove why Marcia would lie, you'll need to be able to prove that she's trying to kill King Coltzan." Resa added, "Preferably before she actually does it." Dom nodded as he drank his own tea – he seemed to like it more than Marlos did. Marlos looked to him and asked, "Any ideas as to how I'm going to get that proof?" Dom shrugged. "Go and steal it – how else? 'Lest you'd like to go say pretty please." Tomos actually grinned. "Could we help? Nabile and I would help!" Horace leaned back against the wall. "Could be a lark – 'lest we all end up in the dungeons." Ilias shrugged. "Hey, if we get caught, we let the guards swarm Marlos and we run for it." Resa scolded, "Ilias!" But the Chomby only smiled. Dom looked around. "All in?" Every hand went up except for Bokan's – Tomos and Horace both glared at the Techo, who shrank a little as he put his own in the air. Marlos was touched. Certainly, he knew that these thieves were only throwing their lot in with him out of a sense of adventure. But he was in a far better place because of them than he'd been last night. "Thank you. Thank you all." Resa leaned against the wall and folded her arms. "So, what's our plan?"